Romaine lettuce (Lactuca sativa var. longifolia) thrives in cool temperatures, making it great for growing in the spring or as a fall crop, but if you want to grow it into summer, choose a heat-tolerant variety to prevent . Romaine lettuce growing in a plot of soil. Romaine lettuce likes cool, well-draining, nutrient-rich soil to germinate seeds. Prepare garden beds for direct seeding by spreading a 3-inch layer of compost on the soil and working it into the top 4 to 6 inches of soil, as soon as soil is workable in the spring. Allow it to break down in the soil for one to two weeks before sowing seeds. When planning where to grow romaine, keep in mind it needs at least five hours of direct sun each day. For spring planting, sow seeds 1 inch apart in rows 10 to 12 inches apart when the soil has warmed to 40 degrees Fahrenheit at night. Seeds germinate in soil between 40 to 85 degrees F, but growing plants prefer air temperatures between 60 to 65 degrees F. Plant early so lettuce is harvested before temperatures heat up. Warm temperatures cause lettuce to bolt, making it bitter. Sow seeds 1/8-inch deep and plant about a 2-foot row every two weeks if you want to have a continual supply of fresh lettuce throughout the growing season. Seeds need to stay continually moist to germinate, so water after sowing and keep soil moist, but not waterlogged, until they germinate in one to two weeks. When sprouts have three leaves, thin to one plant every 8 inches to allow heads to form. 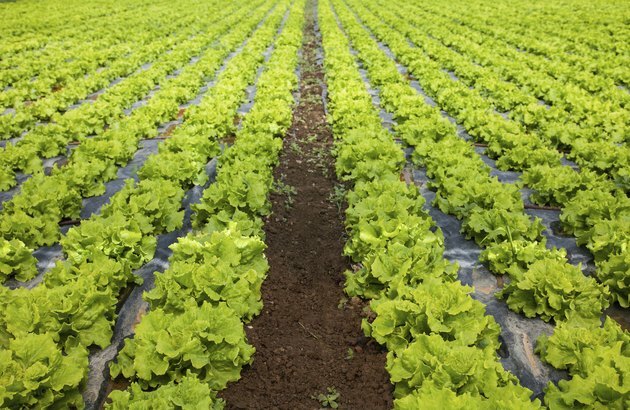 When planting romaine as a fall crop, plan on sowing seeds when soil temperature has dropped below 85 degrees F, and so lettuce will be ready for harvest before the first fall frost. You can cool hot summer soil by erecting 60-percent density shade cloth over it. After one week, check the soil temperature by sticking a soil thermometer, available from seed sellers, 1 inch into the soil. When the soil temperature reaches 75 degrees F, remove the shade cloth and sow seeds. Sowing seeds at 75 degrees F allows for some re-heating of the soil, without it reaching 85 degrees F. To grow and harvest romaine as baby leaf lettuce, sow 60 seeds per foot in a band 3 inches wide. Do not thin. Instead, harvest young tender leaves as they come on. Romaine lettuce has shallow roots which tend to dry out fast. 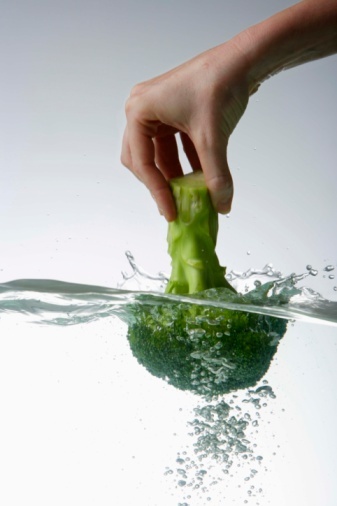 When lettuce doesn't receive enough water, it tends to bolt. Prevent this by keeping soil consistently moist, not soggy, throughout the growing season; mulching around plants with a 2-inch layer of mulch helps retain moisture so you don't have to water as often. Water and mulch also keep the soil cool. Fertilize romaine about halfway through the season by using the point of a hoe to mark out a trench 3 inches deep, within 6 inches of the plant roots. Use caution to not damage the roots. Fill the trench with 2 inches of compost and cover it completely with dirt. When you water, the nutrients in the compost will leach down into the soil where the plants can feed on it.